Eastern Uganda has a lot of exciting activities and sights for a memorable Uganda safari. Two of these are Mount Elgon and the magnificent Sipi falls. You can have a rich and complete safari experience just visiting these two places. They have amazing scenic views, exciting activities such as hiking, biking, abseiling, nature walks, birding, hot springs, ancient rock painting, caves to explore and so much more. Mount Elgon national park and its surrounding areas are a perfect holiday and safari destination. A trip to Mount Elgon national park, with visits to Mount Elgon and Sipi falls is the perfect way to wind down from all the hustle and bustle of Kampala, and any other fast paced city. Because of the growing popularity of gorilla trekking, most people who visit Uganda head straight to western Uganda and that is where most safaris to Uganda are happening lately, but that means that many visitors to Uganda are missing out on the scenic beauty of mount elgon, mount elgon national park, and the magnificent roar of sipi falls. Mount Elgon was once the highest mountain in Africa, but volcanic activity over the centuries reduced it to what it is now. It is no longer an active volcano and is the largest intact mountain caldera in the world. 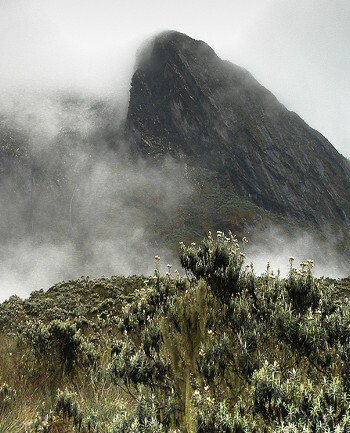 Many visitors interested in mountain climbing see Mount Elgon as an easier mountain to climb and it is. You do not need to be a skilled mountain climber to enjoy a mountain climbing experience on mt elgon. An average hiker or biker can enjoy this experience as well. There are qualified guides and porters to guide up and down the mountain, and to carry your heavy gear and lighten the climb. What should you expect on a Climb up Mt Elgon? Expect to see the gradual change of vegetation belts as you go higher. On the lower slopes you will find dense forest and due to the rainfall in the area the trees are often covered lichen, vine like lians and epiphytes while the forest floor seems to be carpeted with ferns and flowering plants such as wild orchids. The Bamboo forest region is next at about 2,000 plus meter elevation, beyond that is the open woodland, further on up you have giant heathers in meadows of grass and flowers, onward and upward to the Afro-Montane zone with its giant lobelias an groundsel. The climb is an exhilarating exercise and a good way to spend a few days of your safari. There is a lot of history and geography to be learnt as you climb and explore this great caldera. On the foothills of the mountain, you can hear the sounds of the sipi falls, which are also a must see on your visit to eastern Uganda. What are some of the other things to do on a visit to Mount Elgon? You can still enjoy your time around Mount Elgon without climbing the mountain. You can visit the park and see some wildlife, or go bird watching, go on nature walks, or explore the villages, caves and interact and learn about the Bamasaba people who live in the area. You can also go mountain biking. You can visit the forest exploration center and other trails on the foothills of the mountain. The forest exploration center is found near sipi town and used to be an educational center, but is now a trail-head for those who want to go mountain climbing. It however is still the perfect starting point if you want to explore caves, and see the various waterfalls, escarpments, and valleys. The avid birder can also have some fun. There are various bird species that you can spot in the area such as: Eastern Bronze-napped Pigeon, Hartlaub’s Turaco, Lemon Dove, African Hill Babbler, Alpine Chat, Dusky-Turtle Dove, Black-throated Wattle-eye, Thick-billed Honey guide, Mountain Yellow Warbler, Grey Cuckoo-Shrike. There are also various trails for those interested in nature walks. You can go on a half day nature walk with guides from the Uganda wildlife authority and see some interesting flora and fauna or visit Sipi falls. Sipi falls is truly a gem in the East. The waterfalls are a sight to behold. They have such a scenic beauty and the roaring sound of waters falling down a steep rock makes it all simply magnificent!! A tour of the falls is well worth a trip to eastern Uganda. Exploring the caves behind the falls is very exciting and one of the trails can take you to the top where you will be able to see the water from above. The aerial view of the falls is breathtaking! 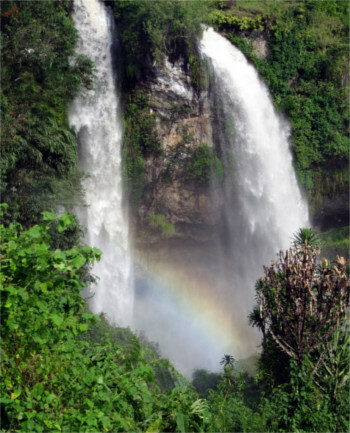 Mount Elgon and Sipi falls are two very good reasons to visit Eastern Uganda on you Uganda safari. We recommend it, and are sure many tour and travel companies do too.